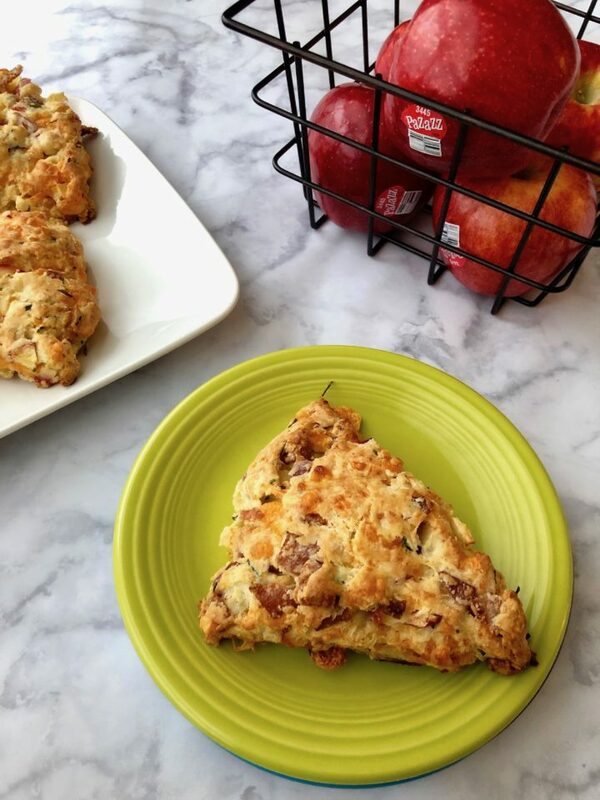 Pazazz Apple Bacon Chive Scones are exactly what I want for breakfast every day. I thought these would be the perfect sweet and savory combination for a special Valentine’s Day breakfast for my sweetheart. This recipe combines some of my family’s favorites like apples and bacon. This recipe is sponsored by Pazazz Apples. All content and opinions are my own. Anyone else out there major apple lovers? Seriously my kids go through at least five pounds of apples a week. When Pazazz Apple reached out for me to try this new apple variety I was excited to give them a try. Have you heard of Honeycrisp Apples? These are very similar (they are a descendant of the Honeycrisp apple but they have their own unique flavor). They are a large hard and crispy apple that is both sweet and tart. Lucky for you Pazazz Apple won’t reach peak flavor until January-April so make sure you look for them at a store near you now. Testing this recipe out I knew I was on to something good when my seven-year-old son said he wanted these for his birthday breakfast. Each year I make the kids whatever they would like on their birthday and I love hearing what they plan. Well, this year, Kasper has his birthday breakfast planned six months in advance. I lucked out he chose something so easy to make! I have been thinking about savory scones for so long and finally got around to making a few batches. 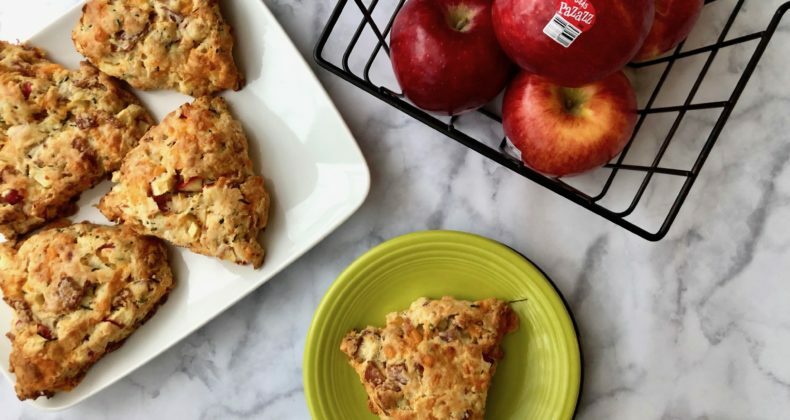 Seriously savory scones are breakfast magic! I was hoping the apples would hold together after baking so I did not peel them first. Well, the Pazazz apple held together so well when baked you are sure to get a nice tart apple taste in each bite. Winner! So whether for birthdays, Valentine’s Day, or because school has been canceled for the billionth time this winter due to snow and/or negative temperatures, a warm savory scone will warm your heart and fill your belly with love.